You know, I love oatmeal. So I’m sharing a favorite recipe with you. I’ve been eating my oats sprouted for a while now, and not only do I like them better (nuttier, hardier taste), but I also feel more energized (likely because I’ve made my portion smaller too, ha!). But in all seriousness, the sprouted oats have more fiber and protein than the non-sprouted version, so it helps to keep my blood sugar more balanced. When you sprout, you also reduce the lectin content too (lectins are the protective covering naturally grown in nature on many grains, nuts, seeds and veggies – and to those who are sensitive can be pro-inflammatory; I seem to be one of these people). Sprouted oats are gluten free too. Who’s sprouted oats do I use? These by One Degree Organic– I love them. As always, I like to add blood-sugar balancing ingredients to my food, especially my oatmeal. 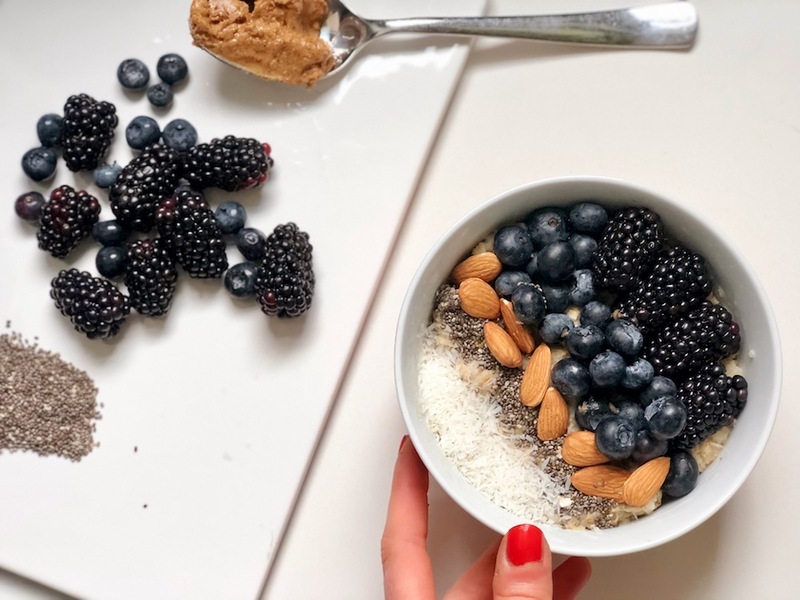 So I add some nut butter and coconut shreds- but you could add chia seeds, protein powder and anything else you like that has some protein and/or healthy fat. Check out this yummy recipe! Not pictured, I also have sautéed greens and some organic chicken or turkey alongside. Prepare your oatmeal in the microwave as I do OR follow the instructions on the side of the packet- usually 5-10 minutes on the stovetop, combine the water and oats in a pot, stirring occasionally. Wash and prepare your ingredients- and add to your oatmeal when it’s cooked.